Chatter about your life here: Ok, I guess I will! I have a super exciting weekend coming up and I think you should all know about it before I get too deep into this review. So I’m going up the coast to one of my favorite places in the World, San Francisco, to meet with some of my closest friends for a weekend of amazing music and amazing food and amazing drinks. I’m going to a big-time music festival where some of my favorite artists will be breaking down barriers with their songs. I know. I get a little poetic. Just wait until the flavor review section. You will be blown away by all the fun I have describing how these protein powders for women taste. But. Yeah. I guess we can jump right into the flavor section. I don’t have much of anything else going on in my life right now. Just livin’ for the weekend! Oh- and be sure to tune in on Monday too for a super hungover review. I pity the product that gets my lousy-mood review that day! Lol. Jk I probably won’t (be able to) do one. Ok let’s talk Raw Greens Organic Vegan Protein flavors. Luckily my friends literally are in love with this product so I was able to try two flavors for comparison. The first one I tried was the vanilla. This shake mixes green which is a little unnerving. But when you actually drink it, it tastes like a vanilla, er, strip of grass. Lol. Nah. It’s actually ok. But I don’t think it’s anything to get terribly excited about. This is a product that tastes like almost all the other vegan proteins. 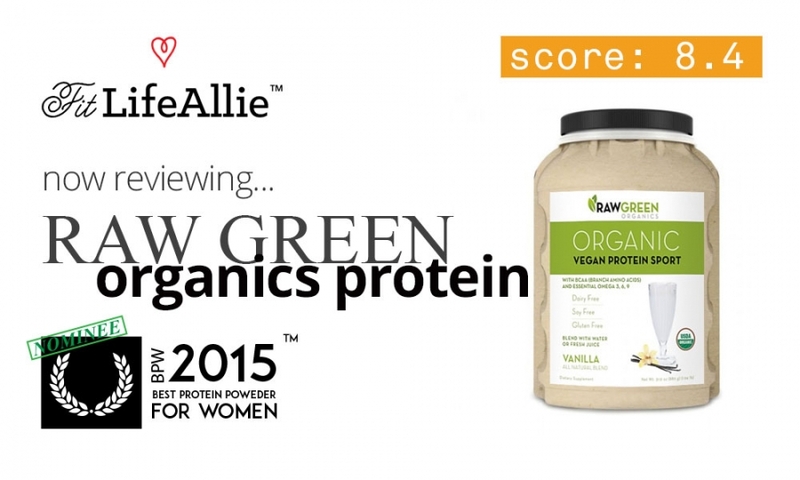 With the exception of our BPW Gold Medallist for Best Vegan Protein, Gardenia, this product falls among the ranks of products like Orgain, Vega ONE, and so on. It’s weird because my friends sold me on this product so hard on taste! I don’t know if they were playing a joke on me, but the reality is that I’ve tried so many of these products by now that I’m very hard to please on taste. But hey. For all intents and purposes, the taste of this protein is just fine. The vanilla flavor is a little sweeter and smoother than the chocolate. The chocolate really needs some tweaking in my opinion. It’s just a very ‘thin’ flavor. It’s almost like there’s a flavor knob that just needs to be cranked way up. Another consideration with the taste of the Raw Greens Organic Vegan Protein is that when you consider the protein sources, it’s not really a surprise that this product is sort of, well, underwhelming. Speaking of the sources, why don’t we talk about those next. Like. Now. I like simple. Don’t get me wrong. But I’m not really a huge fan of Vegan proteins to begin with. Since that’s the case, this product doesn’t really get me going that much. I do like how the product is clean and natural, but for me, my stomach doesn’t handle the high amounts of pea protein. It’s strange because some Vegan proteins settle up pretty nicely in my stomach without causing discomfort. But then there are some, like this one, that DID sort of churn up my stomach. It’s not like a shooting pain or anything like that, but it’s just that little bit of uneasiness that you get sometimes. I think stevia also can have this impact on my stomach as well- so it could be that this is the reason for the stomach discomfort. If nothing else, this product is consistent. The packaging is very much inline with every other component. It looks GOOD but not GREAT. The bio-degradable-looking jar is a nice touch, and gives you a feel for how natural and ‘RAW’ the protein powder is. In terms of the label itself, I’m not that crazy about the direction they’ve gone graphically. There’s a really big oddly-shaped glass of a protein shake on the lower right quadrant that is an indicator of the product flavor. But I don’t think I like it. Check that. I know I don’t like it. It doesn’t seem to match the rest of the design. In shape. In color. Anything. I don’t know. It’s ugly. Speaking of ugly- the shade of green that they use for the main block of color behind the product title is totally horrible. It’s a pea green but it’s very de-saturated. It also does a poor job of contrasting with the white text in front of it. The text itself, speaking of such, is also too thin. Thin fonts just aren’t a good idea on a product label- that’s one thing that I think they messed up on. But hey. This is clearly a young company with a ton of growing up to do. I think they’ll get it right!